Memphis is on the bucket list for most music lovers, but it's also a mecca for food. 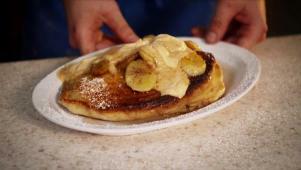 Chuck gets a taste of rock-n-roll with peanut butter and banana pancakes cooked in a wood-fired pizza oven at Rock-n-Dough Pizza Co. Then, he experiences a nutty treat that's been popular since 1929 at The Nut Shoppe, along with soulful barbecue with a Memphis pitmaster at Rendezvous Rib Shipping. And no trip to Memphis is complete without fried catfish with the Queen of Southern cuisine at Felicia Suzanne's. 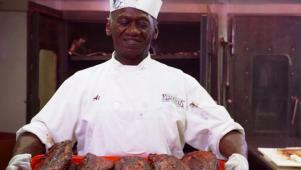 Chuck Hughes tries soulful barbecue at Memphis' Rendezvous Rib Shipping. In Memphis, Chuck stops by Rendezvous to try their soulful barbecue ribs.